Lithium ion batteries should be stored at 20% to 50% State of Charge (SOC). 1) Starting with a known SOC and adding or subtracting capacity from the battery. 2) Charging or discharging the battery until it reaches a specific voltage that represents the desired SOC. Below we explain the UBA procedure to implement each of the above methods. The maximum SOC for shipping lithium ion batteries is 30% so we use a target value of 25% which allows a 5% margin and also is ideal for storing lithium batteries. There are two well defined SOC states: a fully charged battery is 100% and a fully discharged battery is 0%. The easiest way to put a battery at a 30% SOC is to start with it fully discharged and then charge it 30%. After these two actions, the battery will be at 25% SOC. 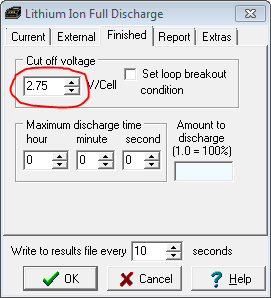 This method works best if it’s performed immediately after a battery capacity test, as all that’s required is a 25% charge (approximately 20 minutes). 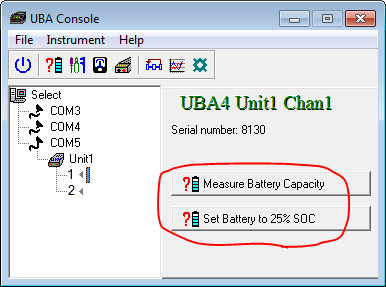 If you don’t need to measure the battery’s capacity then you can go directly to a specific SOC by using the voltage method explained below. This method is more complicated then the previous method but it doesn’t require a full discharge. We present it to show some of the more advanced features of the UBA5. 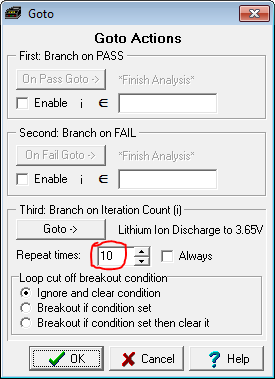 Don’t let the complexity scare you, as we include a battery analysis routine (BAR) using this method with our software. We know that lithium ion batteries have a direct resting open circuit voltage (OCV) vs SOC relationship so in this method we’ll use that relationship. The OCV for a 25% SOC is 3.75V per cell. So we’ll charge the battery to 3.9V per cell (i.e. greater then our 25% target SOC) then discharge it to 3.65V per cell. Why 3.65V instead of 3.75? Because there’s a bit of “bounce back” where if you discharge a battery to a certain value, then remove the load, the battery’s voltage will rise back up. The amount of “bounce back” depends on the relative discharge current, the higher the discharge current, the higher the bounce back. 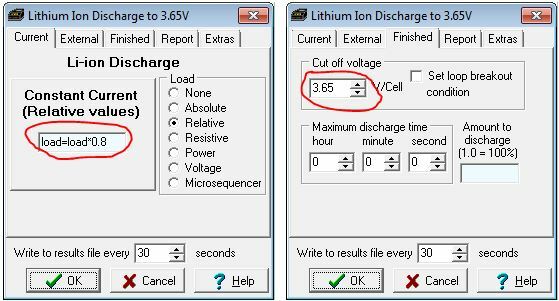 The method we use is to discharge to 3.65V at 1C then repeat the discharge to 3.65V at decreasing currents until we reach 0.1C, then at that point we exit the routine. 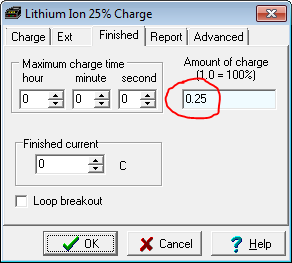 To do this we start with a current of 1C (in the screen shot below, the variable load is set to 1.25C (1.0/0.8), and gets reduced to 1C on the first discharge). So basically we’re discharging at 1C to 3.65V per cell, then 0.8C to 3.65V, then 0.64C to 3.65V, …., and finally at 0.1C to 3.65V. All these parameters are adjustable so that the final SOC is reached as quickly as possible within the desired accuracy. 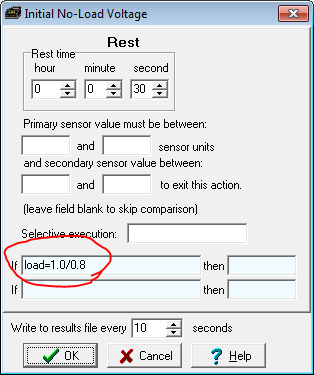 The above setup is designed by your engineering department, so that the operator only has to click one button to set the battery to a specific SOC. Here we’ve made two buttons for the operator, click the first button to measure battery capacity, or click the second button to put the battery into a 25% SOC. The flexibility and power of the UBA5 software is such that you can add as many buttons as you want, name them, and have them run any analysis that you’ve written. All these capabilities are in the software that’s included with your UBA5!